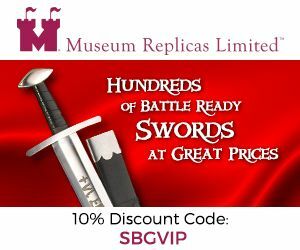 The Ichigo Bankai sword, a faithful but purely decorative replica of the extremely long bladed Nodachi seen in the popular anime series Bleach, is an interesting piece.. 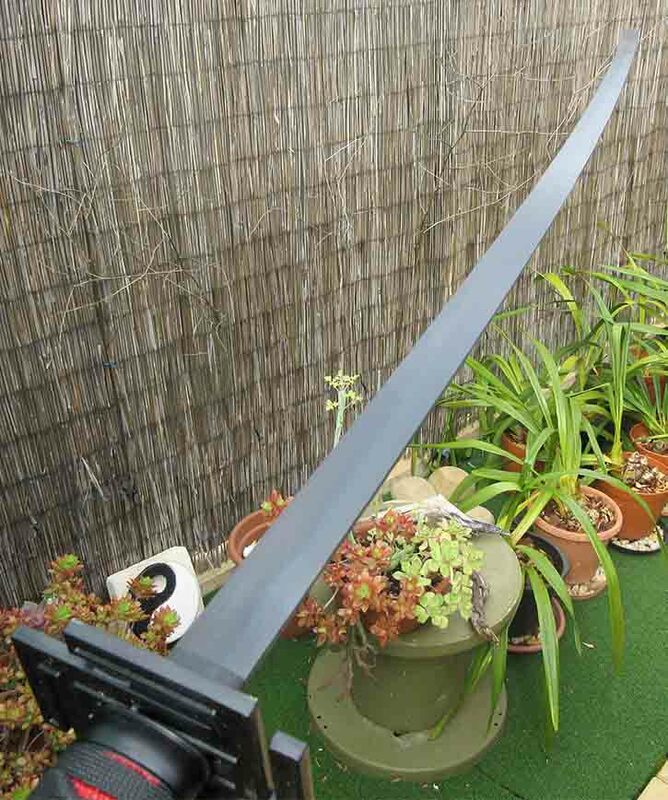 True enough, due to its length, it is extremely unwieldy and while historically there were some extremely long Japanese swords like this one, they were almost always used for ceremonial purposes, being simply too long to be of any real practical use. 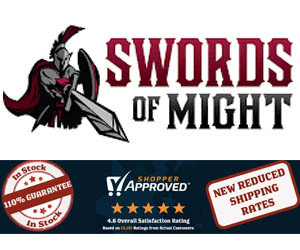 In this hands on review, we will take a closer look at this sword, identifying strengths and weaknesses and letting you decide if it is something you want to spend your hard earned money on. 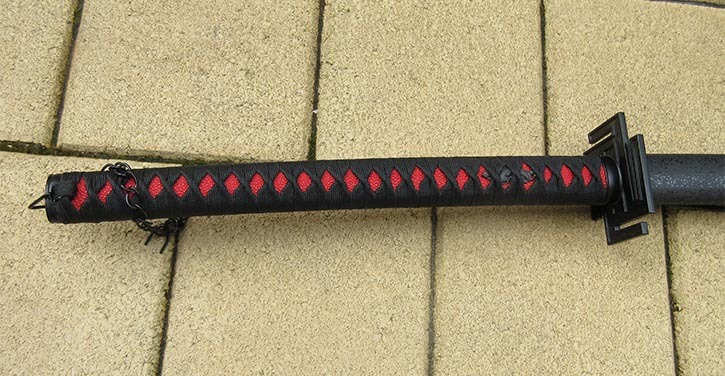 The Ichigo Bankai Sword has at least two things going for it: it's amazing length/size and its price point (often available for just under $50). 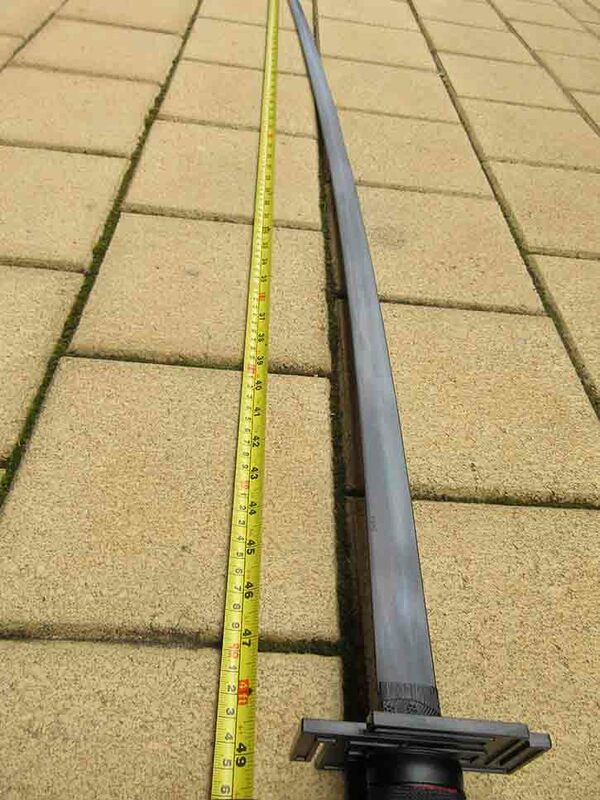 I simply cannot over-emphasize how BIG this sword really is - so here is an image to give you some idea, comparing it at the tsuba (hand-guard) of a standard length Katana. Two things become immediately apparent. 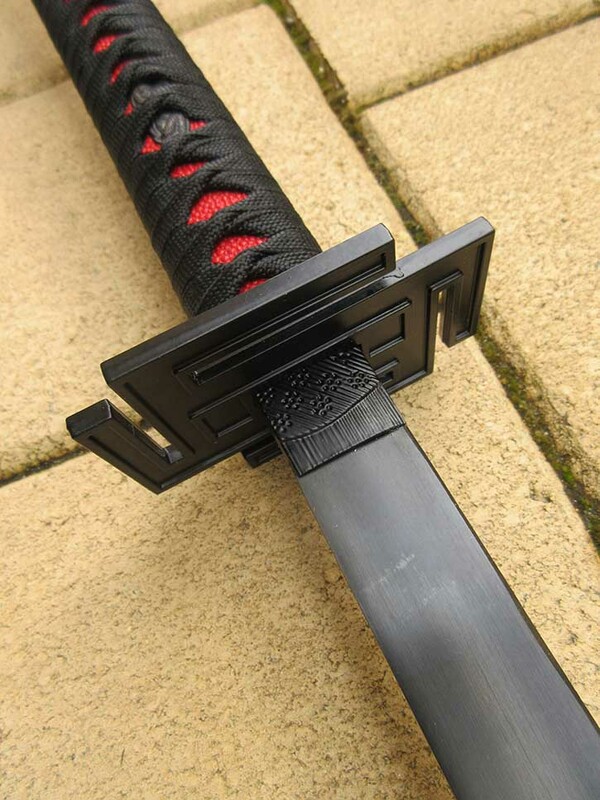 It is almost TWICE as long as a standard Katana, and has a considerably straighter blade than a standard Japanese sword, though still has some curvature as you can see below. 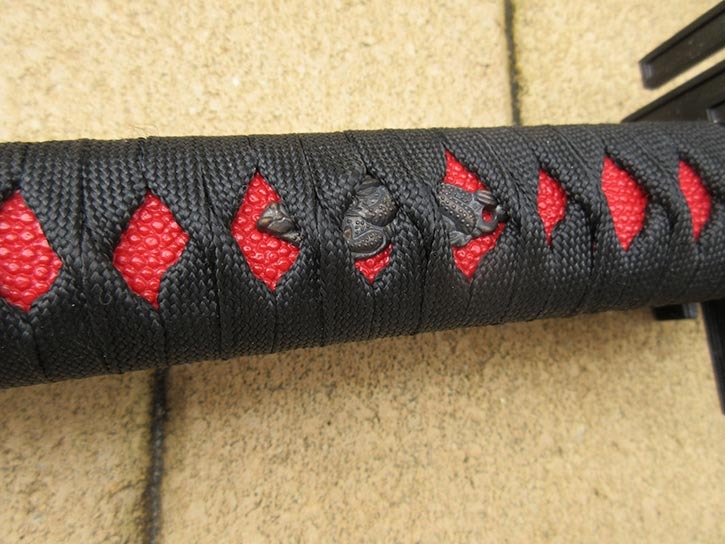 A typical Japanese sword has a length from the tip to the tsuba of around 27-29". 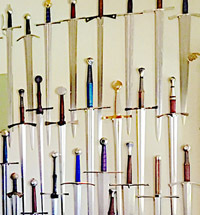 The Ichigo Bankai sword, on the other hand, measures in at a whopping 49" (48" nagasa, as Japanese swords are traditionally measured from the back notch of the blade collar to the tip). 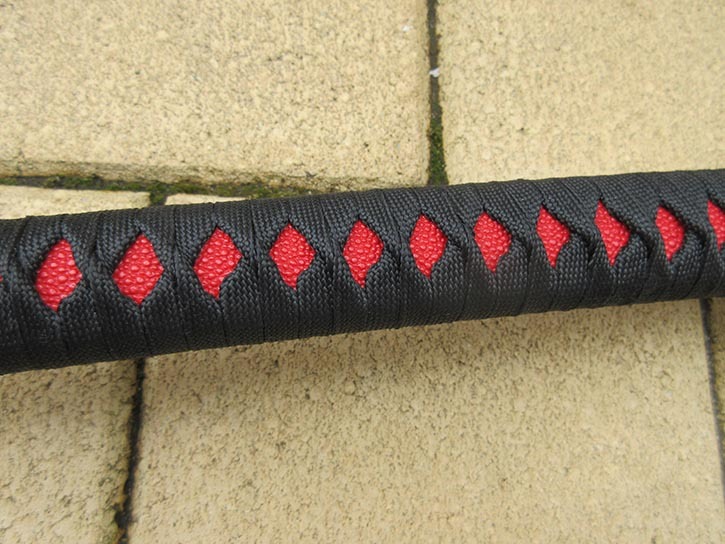 Another thing that sets it apart from most other swords is the black power coated finish and lack of a temper line/hamon - imitation or otherwise. 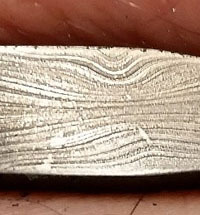 That and the fact that it is actually made of 1045 carbon steel, as confirmed by a simple magnet test. 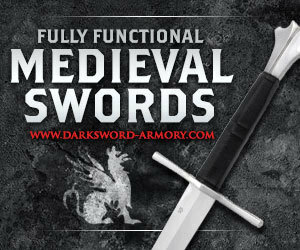 But if you have read our basic guide to to the difference between functional and decorative swords, you will know just because a sword is made from carbon steel does not mean it is a battle ready blade. 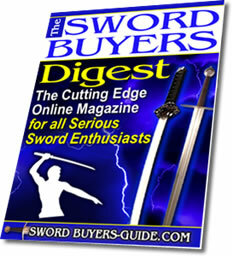 It also needs to be tempered, and full tang at the very least, and the Ichigo Bankai sword ticks only one of the three boxes as is immediately apparent by how the blade sags slightly under its own weight when held horizontally..
For under fifty bucks, this really is no huge surprise - the cost of tempering such a blade would easily triple or quadruple the price. And as it is not marketed as "battle ready" is no big deal. 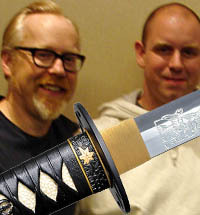 The edge is, as expected, unsharpened. 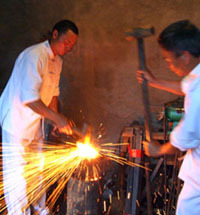 Being made from carbon steel, it could theoretically be sharpened if so desired, but it is not a good idea due to the lack of tempering.. 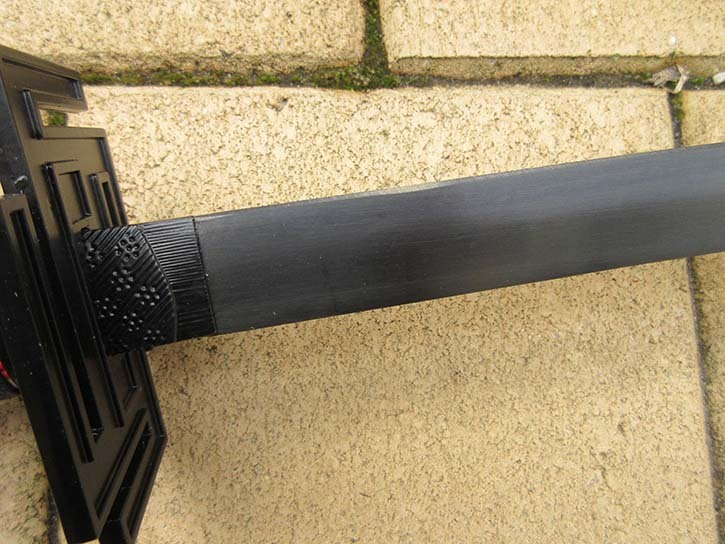 While very long, the blade is not very wide or thick and is essentially machine stamped from a sheet of steel, powder coated and then assembled to the fittings. That said, it still LOOKS quite impressive and, if well mounted on a wall or carried to a cosplay convention, garners some attention. 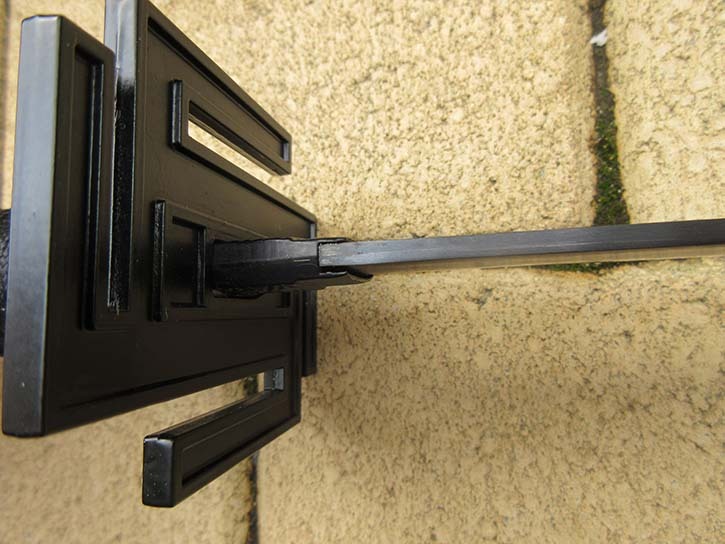 The tsuba is cast zinc aluminium and not very strong, but was well fitted. 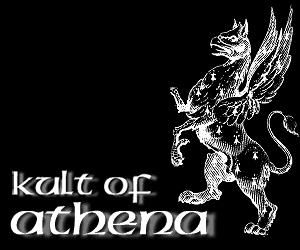 True to the anime, it is not - as some might suspect, a nazi swaztika, but an ancient Buddhist symbol commonly seen at temples and holy sites througout East Asia. 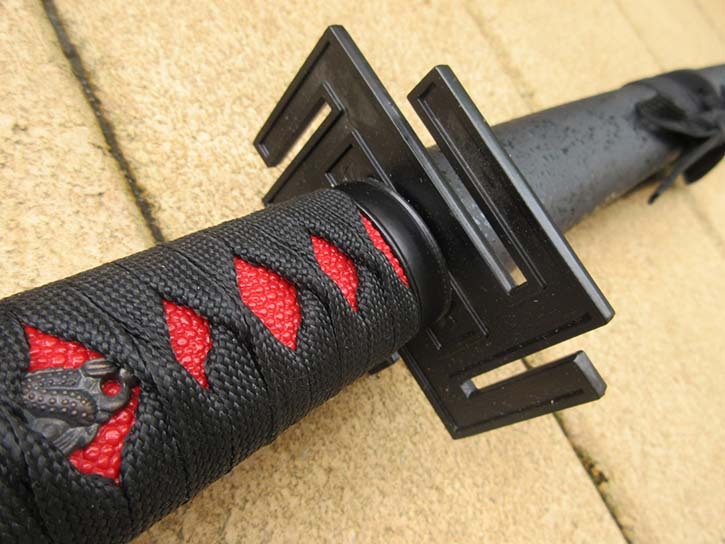 One thing I really did like about the Ichigo Bankai sword was the habaki (blade collar) which fits the blade and tsuba assembly quite snugly and is quite ornate, with flower patterns and lines. 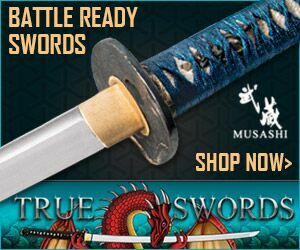 Like the blade itself, the tsuka (handle) is oversized, approx 16" long and - unlike the blade itself and the rat tail tang inside, actually feels quiet solid. Wrapped with the cheapest rayon ito over red, sythnetic rayskin, it will win no prizes for aesthetics or functionality and was clearly done quickly in a non traditional way (traditional ito alternates in the way it is tied). The 'diamond' shape of the wrap is quite uneven in many areas, though is quite tight. A small, brass "menuki" ornament is a nice touch, and seems to be of a Koi fish, at least as far as I can tell. The complete lack of mekugi pegs, which are traditionally used as brakes keeping the handle in place, clearly shows that it was never meant to be disassembled and is fairly typical on a purely decorative piece with a hidden (rat tail) tang. 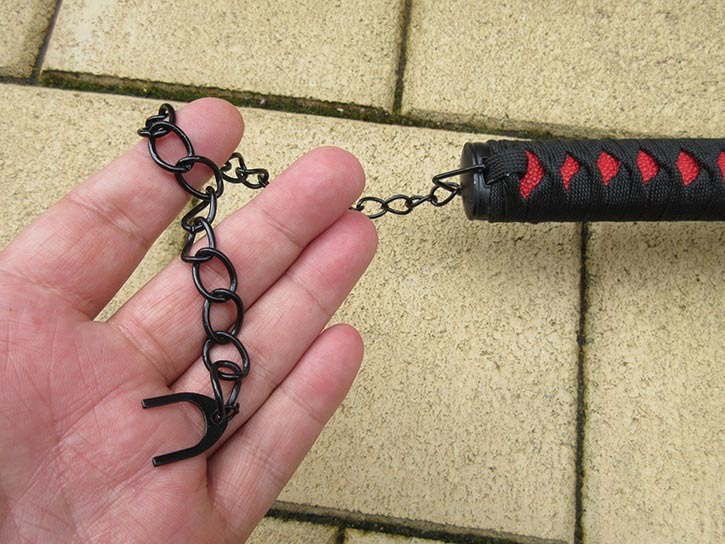 True to the original Ichigo Bankai sword, the hilt assembly is completed by a length of blackened chain attached to the end cap which feels a bit fragile, but will stay on if treated gently and not caught on something. Overall, especially when you consider the price point and its purpose, there is nothing really 'wrong' with this replica so far. And for display or cosplay purposes, as long as it is handled carefully, it achieves it stated goal as an interesting, decorative piece.. However, the somewhat "floppy" blade made me wonder exactly just how far the Ichigo Bankai sword could hold up to a little use, even if it was just to swing around like in the anime series.. 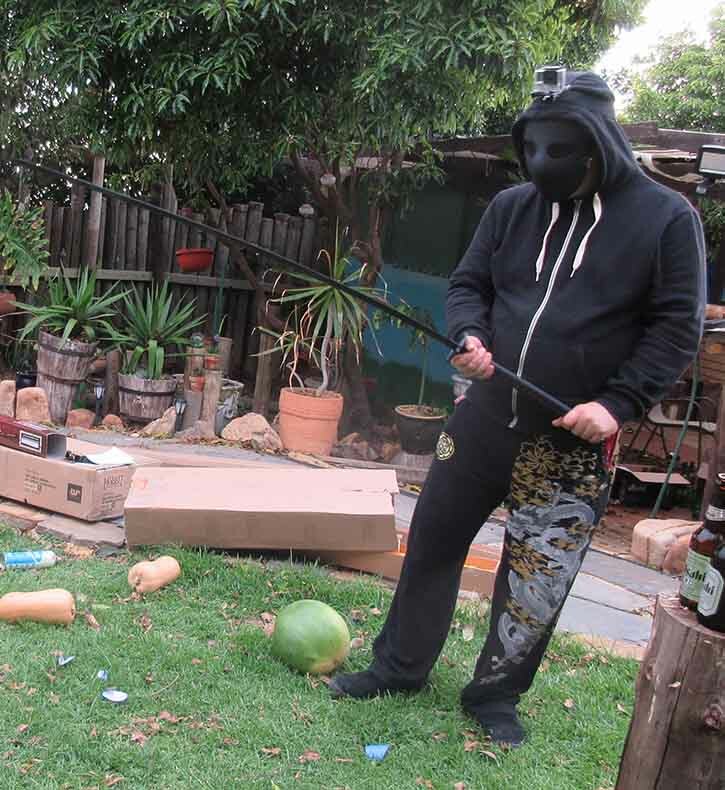 So I geared up with a little face protection and planned a few basic tests.. 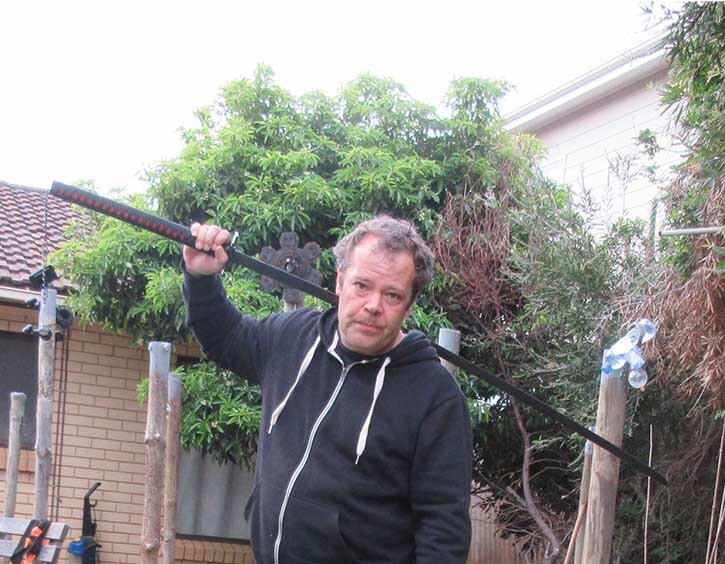 Here you can clearly see how the blade sags under its own weight.. A bit like me really..
My main concern was that if this sword was swung in earnest, the rat tail tang would snap and the blade would come flying out. Considering it is not very thick or very sharp, it would - at least - not be the infamous "flying helicopter of death" but it is still obviously not something that you want to happen..
B) What the tempering (or lack of it) would do.. The result? Well, it speaks for itself..
As you can see, the tempering failed surprisingly early.. Just one swing and it is almost bent to 90 degrees (luckily, it is easy to straighten out). It is a pretty faithful replica of the Ichigo Bankai Sword. 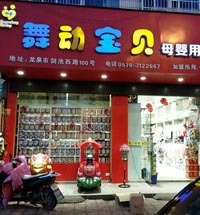 It is cheap, it LOOKS very impressive - but it does not come even close to anything more than a purely decorative piece.. While still good value for money, the fact that it cannot even be swung once without folding in upon itself is a pretty serious limitation. But at least, it is quite safe..